Also covered is the building of the scenery which will tie the backdrop to the layout, and we'll detail that scenery with shrubs and bushes to match the backdrop. 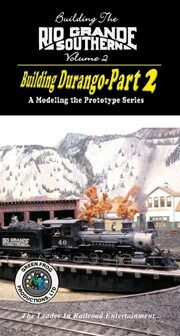 Next we'll tackle the scratchbuilding of the Durango station. Then we'll construct a retaining wall for a small mine, and build a tunnel portal to take us to the next room, as well as construct scenery around the portal and next to the mine. Next we'll show you a very unique way to construct a flat backdrop to represent the town of Durango....and we'll place those flats onto the backdrop.